It is suggested that one should use only four fingers (index finger to little finger) to type letters and numbers, while the thumbs are only used for spaces and other keys in the bottom row. Also, it is thought that one would type better if they always use the same finger for the same key. However, with the Shift being located where it is, one could only press it with their little finger, which means that e.g. to write Z? on QWERTY keyboard one should either do an extra inconvenient keypress (right-shift plus z, then left-shift plus /) or to use their little finger to hold some of Shifts for the whole time, and then use the corresponding ring-finger to press a key that is normally typed by little finger. It seems to me much more natural when both Shift keys are located on the bottom row (e.g. in place of the Alt keys), so that they could be pressed by thumbs. Since Alt keys are used in shortcuts mostly, switching Shifts and Alts seemed to improve typing speed and accuracy for me (once I got used to it). The question is: why on the IBM PC Keyboard (which has the bottom row), Shift key is located where it is, just below the home row? Is there any rationale for it besides the fact it was located there on the typewriters? The shift key comes from the era of mechanical typewriters. 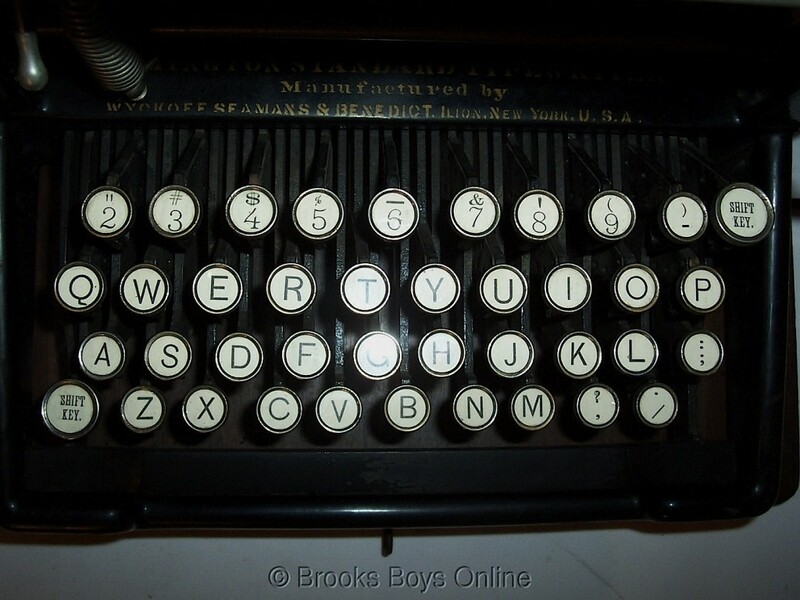 The first typewriter to come with a key that allowed to switch between upper and lower case was the Remington Standard No. 2. After that the shift keys made their introduction. Here's a picture of the serial nr 88.474, manufactured circa 1891. 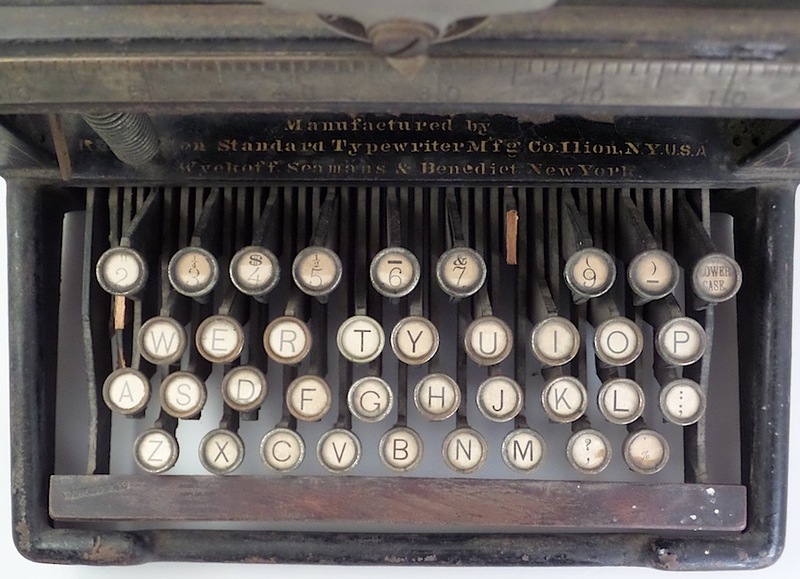 As far as I see this is the first typewriter that positioned the shift key next to the Z. I guess the right shift moved to the same line as the left one later on. We are still holding on to our shift key's positions for the same reason that we are still using a QWERTY or AZERTY keyboard and not a DVORAK keyboard. The shift key is used to activate temporarily the capitalization of the letters and the upper or secondary option on some keys. As is common knowledge. It is a secondary key. Your main fingers are the index, the middle and the thumb. Your less used finger is the ring one. Keyboards, from typewriters time to PC, are designed for optimal use of the movements of the fingers. Without entering on the discussion if qwerty, azerty or any other is the best. So. the shift key, has just limited use. and never by itself, always in combination with other keys, therefore, the right position to use something that requires a dominant key is to be in a position where it can be accessed easily enough, without much thinking and without making more difficult the main action, on reach for the baby finger is a perfect position. Is easily reached and combined with the dominant fingers from the same hand or any finger from the other hand. The bottom row is usually reached by the thumb, and it is pointing to the middle of that row, keys to the sides of the spacer bar, are out of reach, therefore, require special action/movement to be reached. The keys at the bottom, non central positions, are keys with very limited use, so, they are not required to be accessible all the time, but the shift should be handy many more times than ctrl, alt or windows key.